What is a Point Cloud Task (PCT)? A function (Extract ground, Conflate Line) that operates on points and/or vectors. A task can be a filter and/or an extractor. A filter classifies or changes the classification values for points (e.g. classify ground). An extractor extracts information from the point cloud data into vector, image or informational files (e.g. Point Cloud Statistics). The Point Cloud Tasks are accessible on the Point Cloud Task tab of the Table of Contents in Arc (when using the LP360 for ArcGIS extension) or in LP360. LP360 v2018.2 introduced the Point Cloud Task Manager. 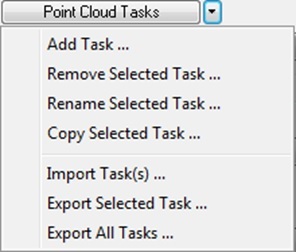 All Point Cloud Task settings are modified on the Point Cloud Task tab, and saved using the Apply button. In order to execute the active task – the one displayed in the Point Cloud Task tab – one must use one of the execute tools located on the Point Cloud Task toolbar. Adaptive TIN Ground Filter Classifies points based on the adaptive TIN ground classification algorithm. See LP360 Automatic Ground Classification Part I for more information. Low/Isolated Points Classifies noise points based on if it is significantly lower or isolated from its neighbors. See LP360 Automatic Ground Classification Part I for more information. Planar Point Filter (Building Filter) Classifies points by fitting points to user defined planes. Examples include building rooftops. Planar Statistics Computes planar statistics of a given plane and output them as attributes to a shape in shape file. Point Cloud Statistics Extractor Extracts point cloud statistics into geographic or text files. Point Group Tracing and Squaring (Extractor) Traces outlines around point groups with optional squaring. Examples include Buildings, and Vegetation. Toe Extractor Extracts the toe line from stockpiles.